Squeezing blackheads will make the problem worse. Blackheads are a seemingly juvenile problem. However, the American Academy of Dermatology notes that blackheads can affect adults of all ages. Characterized by solid blackheads at the tips of your pores, this type of acne is formed by a mixture of natural skin oils and dead skin cells. You can fight blackheads by tailoring a treatment plan to your skin type, which should result in clearer skin within six to eight weeks. To determine your skin type, consider the following: dry skin is characterized by dry patches in different areas of your face, while oily skin is the exact opposite. You may have combination skin if your nose, chin and forehead -- known as your T-zone -- get oily, but the rest of your face does not. Normal skin doesn’t have any of these characteristics. Cleanse morning and night to get rid of dirt and excess oil. Blackheads thrive on leftover oil in your pores, so it’s important to remove it promptly through regular cleansing. After cleansing at night, apply a moisturizer formulated for your skin type; this is often labeled on the bottle. 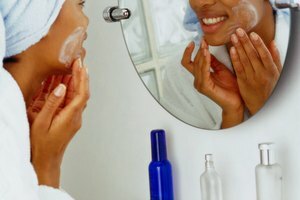 While adding moisturizer may seem contradictory, it can actually help prevent blackheads by balancing your skin’s moisture levels, which can reduce dead skin cell buildup. Gently apply astringent with a cotton ball after cleansing, and before moisturizing, to further reduce excess oil if present on the skin. Use once a day for the first two weeks, then increase to twice a day if no adverse symptoms -- such as excess dryness -- occur. Avoid alcohol-based astringents which are more likely to cause excess dryness. If wearing makeup, choose a noncomedogenic foundation and concealer that won't clog your pores. Match your concealer to your skin tone as best you can, and layer the concealer onto the blackhead and surrounding area to minimize it's appearance. Lastly, lightly brush the blackhead only with a neutral shade slightly darker than your concealer to cause it to appear even smaller. Stress, excess carbs and sugars, and hormonal imbalances can all lead to breakouts. Don’t skip out on your yoga session and make sure to eat a healthy, balanced diet. If blackheads still persist despite the necessary changes, see a dermatologist. You may need prescription-strength acne treatment to treat and prevent breakouts. Always resist the temptation to pick or squeeze a blackhead with your fingernails. Doing so can actually cause more blackheads, not to mention scars. Cherney, Kristeen. "How to Get Rid of Blackheads in Adults." Synonym, https://classroom.synonym.com/rid-blackheads-adults-12830.html. Accessed 20 April 2019.